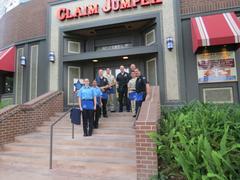 The Burbank Police Department would like to thank the community for attending the “Tip-A-Cop” event, held at the Claim Jumper Restaurant on Thursday, April 17, 2014. Burbank Police Officers, Cadets, and Explorers were in uniform and assisted the staff at the restaurant in serving food and waiting on tables. Through the “Tips” collected they were able to raise approximately $2,500.00 for Special Olympics. The money collected goes towards transportation, facility rentals, and uniforms for the individuals who participate in local competitions with the Special Olympics. We thank you, as a community, for helping to make the “Tip-A-Cop” event a success!